Cross section of a Smart Elbow deflection elbow. The ball of material in the pocket slowly rotates and deflects incoming material smoothly around the corner, virtually eliminating wear, turbulence, and pressure drop. A simple and inexpensive upgrading of the pneumatic conveying system at the Rensselaer Plastics Co., Rensselaer, IN., is reducing maintenance while saving the company money in a number of ways. Rensselaer Plastics Co. specializes in PVC piping products for the plumbing trade. Annual sales of the company are in the range of $40 million. Rensselaer's pneumatic conveying system, which transfers resin and pellets from storage hoppers to the pipe extruders, has worked well except in one area: it had an Achilles' heel, or, one might say, an Achilles' elbow. Even though the system designers installed long-radius sweep elbows, the abrasive nature of the airborne stream of resin and pellets took its toll. The elbows wore out in a matter of two to four months, according to L.E. Koehler, assistant plant manager. Downtime for replacing the elbows was eating into profits. Koehler explains how he solved his elbow problem: "I had been reading about a new elbow design called the Smart Elbow® deflection elbow. The manufacturer guaranteed a minimum of three times the life of conventional elbows. So we put a test elbow in the system, replacing a conventional long-radius elbow that had worn out within two months." After more than a year of service, the test elbow shows no sign of wear. Based on that performance, Rensselaer Plastics has upgraded its system with 12 Smart Elbow models in 3- and 4-inch lines that carry materials between resin silos, compound silos, mixers, and extruders. The upgrading project is continuing; a Smart Elbow deflection elbow replaces each conventional long-radius elbow as it wears out. The company estimates a savings of $2400 in replacement so far — the number grows every time a long-radius elbow is replaced by a Smart Elbow deflection elbow. Downtime expense has been greatly reduced. Another advantage of the new elbow is that the "angel hair" previously formed in the conventional long-radius elbows has been mostly eliminated. In addition, there is no surging or plugging with the new elbows. As a result, blower power requirements have stayed constant. 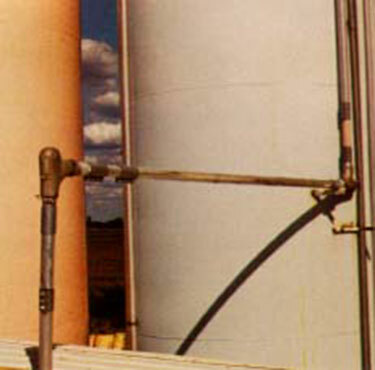 Still another plus is that the short radius of the elbows permits pneumatic lines to hug the contours of a building or silo instead of needing installation away from a wall. 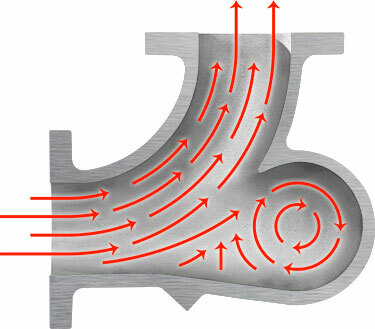 The figure shows how resin or pellets flowing through the Smart Elbow deflection elbow form a loose, rotating ball of material suspended in air within the chamber. Particles coming off the bottom of this rotating ball are projected up and out. As the diagram shows, these particles serve to deflect most of the incoming material smoothly around the corner. Some material filters through to replenish the ball so the process is continuous. Reduced parts replacement. The new elbows last years, not months. 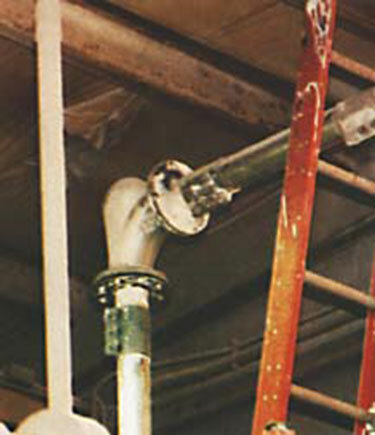 Elimination of product loss, which occurred when resin spewed out of holes worn in conventional long-radius elbows. Reduced downtime. The new elbows are easier to handle, change out faster, and last longer. Smart Elbow models are available in 45° and 90° angles, and in diameters from 1-1/2 to 16 inches. They are furnished with plain or flanged ends in carbon steel, cast iron, stainless steel, HammerLoy™, or aluminum.